As the new ship successfully launched, MIT delivered a bespoke exhaust suspension system to Cammell-Laird Shipbuilders in Liverpool who have the official contract to build the 128m, 5,000t Sir David Attenborough world-class polar research vessel. Designed by Rolls-Royce, the vessel is set to be the first of its kind. With the ability to carry a scientific cargo of approximately 900 cu meters with an icebreaking capability of up to 1m thick at 3 knots, she will be able to withstand up to 60 days at sea within the Polar Regions. Travelling up to 19,000nm at 13 knots of transit the vessel will house up to 29 crew and officers and up to 60 scientific and support staff, along with boasting a heli-deck and hanger, a science hanger, a moon pool and on-board submersible which will be deployed for underwater research. Due to the nature of her work in natural environments, the critical challenge to a diesel engine exhaust system is the ability to run at full power while emitting the least noise and vibration as possible, both within the vessel and into the marine environment. Limiting the levels of noise and vibration pollution provides minimal disruption to marine life and to the scientific measuring equipment on board, which is imperative to operations such as those that will be carried out on her deployment. This challenge, accepted by Rubber Design, a leading international specialist in solutions for noise, vibration, and shock related problems. Experts at developing solutions that isolate the source of disturbance reducing marine noise and vibration pollution for an array of ocean-going projects. Working from plans supplied by Rolls-Royce, the expertise of Rubber Design meant they were able to provide a bespoke system built precisely to design specifications. The suspension system will comprise of 148 fixed-point mounts, 142 stabilisers, and 30 stainless steel bellows, forming the complete section that will hold in place the chosen exhaust system. A typical array from Rubber Design would be equipped with double elastic mounting systems, with calculations and design provided for not only the intermediate frame but a variety of measurements to determine the optimum mounting types, rubber hardness and frequency calculations to aid in the reduction of noise and vibrations. The relationship built between Rolls-Royce and Rubber Design on previous projects and the engineering excellence and product adaptability of Rubber Design products made them the clear supplier of choice when addressing such a significant portion of the specification and build. The vessel is fitted with 2 × Bergen B33:45L6A (2 × 3,600 kW) and 2 × Bergen B33:45L9A (2 × 5,400 kW) diesel/electric engines to improve fuel consumption and reduce environmental impact. MIT provided local technical and logistics support while also ensuring that each of the 320 individual components was delivered on time to each exact job location, ensuring that the build plans were on schedule. Meantime the hull of the ship is protected by the most environmentally-safe hull coating ever developed – Subsea Industries’ biofouling-reducing and washable Ecospeed. When the vessel is delivered to British Antarctic Survey in 2019, it will undertake world-leading environmental research into climate change and ocean protection. As such, the vessel required a fully ice-strengthened coating, without being harmful to the environment. “Ecospeed fulfils that requirement,” said Hof. “Ecospeed is a safe, hard-type coating with zero metallic compounds. It eliminates the potential pollution of polar waters with heavy metals or biocides and hull contamination during research activities, which is extremely important to the scientific work the vessel will carry out. The hard coating completely mitigates against the leaching of chemicals into the marine environment”. 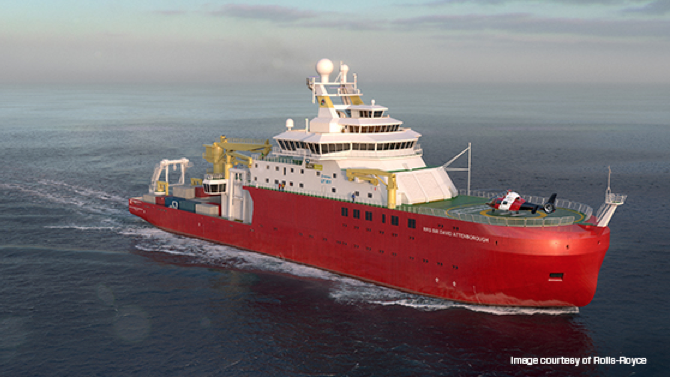 The Sir David Attenborough research vessel will be operated by the British Antarctic Survey and is due to enter service in 2019; we eagerly await her first expedition.